​The New York Historical Society is one of New York’s best hidden gems. Yet, it's one of the lesser visited museums in New York City. We came up with a native mobile app which would engage children with the museums content in order to attract families to come visit the museum. 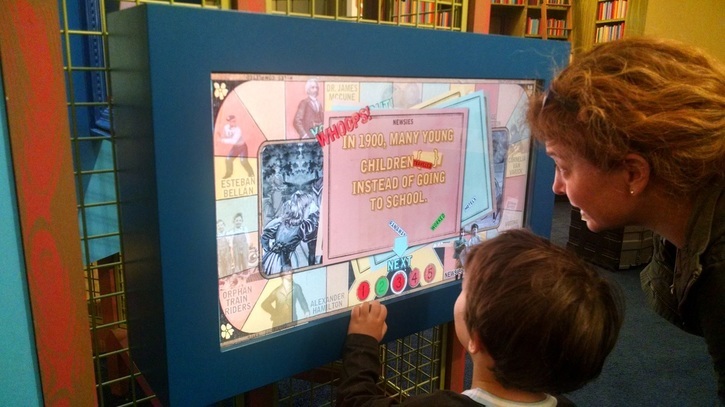 ​We created a mobile app which lets kids play with pictures of objects in the museum and combine them into their own exhibit. The unique feature of our app is that they can upload the finished project to the museum's website. ​New York Historical Society is a business which is interested in selling admission tickets. At the same time it's a cultural institution with a higher goal of educating and promoting knowledge and education. Attracting more children to visit the museum serves both purposes. Mobile technology could be used to engage children with the museum content in order to educate, entertain and encourage to visit the museum. ​Our task was to create an app which would be engaging, informative, but above all would have a unique feature leading kids to visit the museum. Successful solution of this task would solve for the museum's need of increasing the revenue, parents' desire to educate children and kids' interest in play. We started the process with research based on surveys and contextual inquiries. In order to learn about families' museum visiting habits as well as mobile phone use patterns, we conducted separate surveys for children and parents. The survey for parents focused on finding out if family visits museums, how often, what kind of experience it is and how this experience can be improved. The children’s surveys were geared to finding out how they used their mobile phones, what type of games they found engaging and how they perceived family time in a museum. Surveys were made with googleForms. ​After interviewing we moved to observing kids in the museums and talking to them afterwords. For contextual inquiry analysis we went to our target museum, the New York Historical Society. We watched which of the exhibit attracted children more, how long they stayed with the exhibit, what made them excited about the process. After observing we interviews kids and parents about the experience. We were invited to attend art classes for children in the Guggenheim and had an opportunity to observe kids' activity and talk to them about it. The main take aways were that children didn't like to observe art passively, they were interested in interactive activities and children liked to see and share their own work. ​"Kids like to be validated"
"Kids like to practice a lot"
"You have to make kids feel successful"
"Kids have low attention span"
"I want my child culturally educated"
"I want to be noticed"
​"I love to show my artwork"
"I can’t speak to all of these answers, except to say that we are very interested in getting children to attend the museum and have an enjoyable experience. If they come as children, they are more likely to continue to visit as adults." 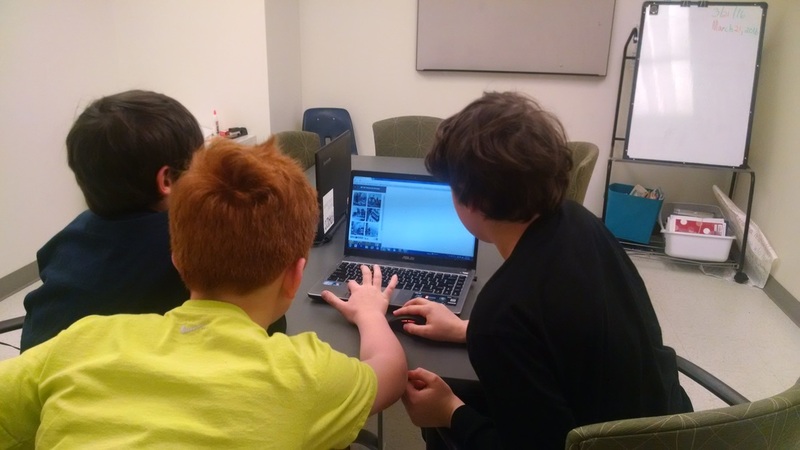 Since children engage with art and technology very differently depending on age, we narrowed our target group to the 8 to 12 age group and came up with user personas. 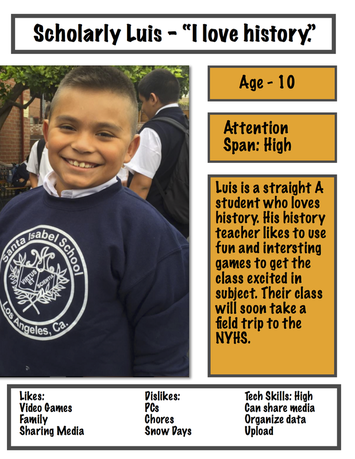 To facilitate validating our hypothesis we chose a brainy 10 year old as our main user persona. After we collected and analyzed our research findings we became convinced that the key ingredient in attracting kids to museums lies in providing them with the opportunity to actively interact with the museum content. ​Based on that we came up the following idea: while in the museum the kid can take pictures of the objects of interest, thus creating an individual exhibit. Through our app, the kid could 'play' with his/her exhibit, rearranging the order, making a slideshow, commenting on some images. The kid could then upload his/her exhibit to the museum where it'd be displayed on a kiosk. Now that the kid's work is located in the museum, the child (based on what we learned in our research) wants to visit the museum to see his/her work on display. This process requires ​3 separate user flows: creating an exhibit by a child, submitting the work to the museum, and retrieving the work when the child visits. "Of course we want more families to attend, and we are always looking for new ways to engage our visitors with our content, including low tech and hi tech approaches." After we collected and analyzed our research findings we sketched and made lo-fi wires which did not test well with in-house users. We went through several iterations before coming to our final decision. We built a prototype, which we continuously tested, then raised the fidelity and finally got to test it with adults - parents and art teachers- and, most importantly, with real prospective users - 10 year olds (all-together 6 adults and 3 kids). Testing with children was conducted in Elysian Charter School, Hoboken, NJ. Kids were interested and engaged for the duration of the test and were very exited about the idea of their work being shown in the museum exhibit. All users were asked to perform specific tasks, for example, find an image, edit it, select it for your exhibit and upload the exhibit to the museum's website. The main problem we were solving for was to get more kids (families) to visit museums. Based on the research finding that kids really like to create, see and show their own work we came up with the idea of an app which lets kids create their own exhibit from the museum objects and share the result with the museum, thus giving them the incentive to visit the museum and invite friends. As the result, the museum increases its revenue and fulfills its mission as cultural institution.